The usage model and power profile of these wireless sensing devices presents unique challenges to the power supply designer in terms of size, cost, reliability, stability, and efficiency. This article describes the source of these challenges. It then introduces examples of the latest low drop out (LDO) linear regulator solutions and explains why they can offer a good foundation for a wireless IoT sensor’s power supply. The article also presents guidelines to ensure designers can take full advantage of these latest solutions to increase the probability of a successful design. To power a sensor, the designer has three options: a switching voltage regulator, an LDO, or a combination of both. It is not a simple choice because each option has some tradeoffs. For example, switching voltage regulators offer high efficiency, which makes them a good choice for extending battery life. However, they are less efficient at low loads, for example when a wireless sensor is in ‘sleep’ mode, which is a much used mode to conserve power. Also, switching regulators are more complex, which pushes up both the design cycle time and potential cost. Also, electromagnetic interference (EMI) caused by the switching regulator’s high frequency operation can affect a sensitive wireless system-on-chip’s (SoC’s) microcontroller and transceiver. Finally, the same interference can also affect the small signal variations from the sensor, limiting measurement precision. In contrast, LDO linear regulators generate very little EMI and are relatively simple and inexpensive to use. However, over a variable input voltage and load range, LDOs are generally less efficient than switching regulators. In addition, they can only be used in a step-down (“buck”) configuration rather than the buck/boost topology of the switching regulator. This can limit accessible battery capacity. LDOs also tend to exhibit moderate transient response to fast load changes, such as when a wireless transceiver rapidly powers up from a sleep state. This leads to voltage spikes that could damage the sensor’s circuits. To take advantage of the switching regulator’s efficiency and the LDO’s voltage-rail stability and robust point-of-load (POL) delivery, it’s common to combine the two approaches. However, such a topology adds complexity, cost and size, as well as layout and inventory management challenges. Instead of combining the two, designers can select an LDO alone but ensure it operates such that efficiency meets the design requirements. Two characteristics are critical, the “drop-out voltage” (or VDROPOUT), and the average input/output voltage differential. With a traditional linear regulator, functionality gets compromised once the input/output voltage drop reaches the transistor’s voltage overhead, which is around 2 volts. This limits efficiency. The typical LDO replaces the NPN transistor or N-type MOSFET used as the series control element in a traditional linear regulator with a PNP transistor or P-type MOSFET (Figure 1). This alters the circuit such that it becomes a current source rather than an emitter (source) follower. The P-type MOSFET can operate near saturation which considerably lowers the minimum input/output voltage difference. This is the “drop-out voltage” or VDROPOUT, at which the device can properly regulate the output voltage. For a good LDO, VDROPOUT is typically less than 200 mV. The introduction of a new generation of LDOs offers the designer an even lower VDROPOUT, to further improve efficiency, limit sleep mode current, and increase the accessible capacity of the battery. As mentioned earlier, wireless sensors spend much of their time in sleep mode. This is to conserve power, but the time spent in sleep mode can reach 99%, so the lower dropout’s ability to reduce the sleep mode current parameter is very important for long battery life. Newer LDOs also feature better transient voltage response and input ripple filtering for a more stable supply, together with improved power supply rejection ratio (PSRR). 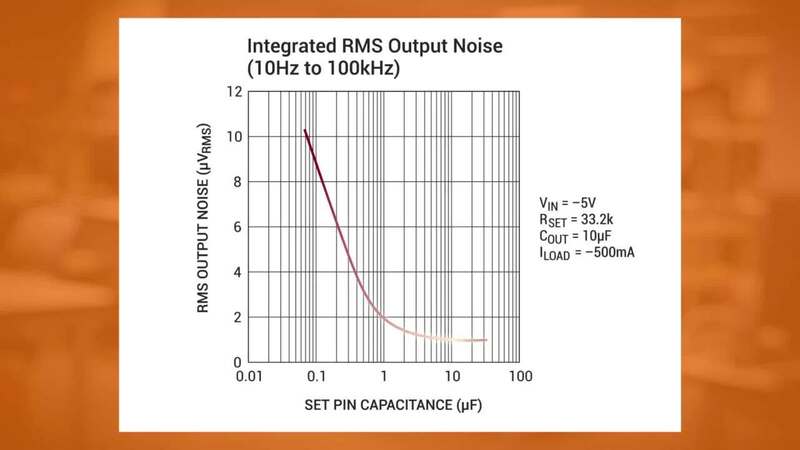 The designer can further improve the transient response of the LDO by increasing the value and decreasing the equivalent series resistance (ESR) of the output capacitor, while staying mindful of its footprint, volume and cost. The PSRR is a measure of how well a circuit suppresses extraneous signals (noise and ripple) on the power supply input. There is no industry standard definition, but it’s commonly defined as the ratio of the change in supply voltage to the equivalent (differential) output voltage it produces (in decibels (dB)). PSRR is frequency dependent. A benchmark figure for a good LDO is between 60 and 110 dB at 1 kilohertz (kHz) (Figure 2). For a battery-powered direct current (DC) input, such as that likely to be used by a wireless sensor, extraneous signals are much less likely than with an AC supply but can still occur. An LDO with good PSRR is a worthwhile investment for such an application because it ensures voltage stability. While the new generation of LDOs offers a promising solution for powering wireless sensors, it is important to understand the devices also have characteristics that must be carefully considered during the design process. For example, a linear regulator can’t invert a supply, so a negative input voltage is needed if the circuitry to be powered requires a negative voltage. A second key consideration in a wireless sensor application—where battery life is highly important—is the fact that LDOs only operate in a buck configuration. This restriction dictates that the battery input voltage must be higher than the highest voltage required by the sensor’s electronics. A typical Bluetooth LE SoC used for wireless sensing, such as Dialog Semiconductor's DA14585 or Nordic Semiconductor's nRF52832, requires a minimum input voltage of 1.5 volts to 1.7 volts if powered by a buck-configured power supply. This has implications for the initial battery choice: a single AA nickel cadmium (NiCad) cell offering 1.2 volts would not be an option. It also affects total accessible battery capacity because a battery might still have some charge when the voltage has dropped below the minimum required by the wireless SoC. These factors come into play when considering a battery, though a common choice for wireless sensor applications is Panasonic's 3 volt, 225 milliamp hour (mAh) CR2032 lithium-manganese coin cell. This cell is characterized by low weight (2.9 grams), high discharge characteristics, stable voltage during discharge, and long-term reliability. While an LDO is generally less efficient than a switching regulator, it does become more efficient as the difference between the input and output voltage decreases; efficiency = VOUT/VIN. The reason for this is that for a smaller voltage difference, less power is being dissipated in the LDO’s internal circuitry. This has the added advantage of minimizing heat related issues. It is possible for an LDO to operate at 95% to 99% efficiency with a small enough voltage differential. A good design approach is to trade-off efficiency against accessible battery capacity by selecting appropriate input and output voltages. It makes little sense to maximize efficiency by narrowing the gap between input and output voltages if the LDO drops out while the battery still has a significant amount of energy remaining. This leads to the question: When will the LDO drop out? At VDROPOUT, the LDO’s pass element (the PNP transistor of a P-type MOSFET) acts as a resistor equal in value to the transistor’s drain-to-source on resistance (RDSON). For a given load current (ILOAD), VDROPOUT = ILOAD × RDSON. For the type of PNP transistor or P-type MOSFET used in today’s LDOs, RDSON is approximately equal to 1 ohm (Ω). The good news is that for a typical wireless sensor, the operational currents are modest so VDROPOUT is in turn quite low. For example, a typical average current load for a wireless sensor application is 190 microamperes (µA). Therefore, VDROPOUT = 190 µA x 1 Ω = 190 microvolts (µV). During wireless data transmission, ILOAD for the wireless SoC could, for example, peak at 7.5 milliamps (mA), which would raise VDROPOUT to 7.5 millivolts (mV). More significant but still relatively low. However, the designer should note that VDROPOUT is the point that the LDO is no longer able to regulate the supply voltage. To meet its full specification, the LDO typically requires additional “headroom voltage”. This headroom typically adds another 250 to 500 mV to VDROPOUT, but it can be as much as 1.5 volts for some LDOs. It’s good practice for suppliers list the headroom voltage in their data sheet. When the wireless sensor is in an ultra-low-power sleep mode, requiring virtually no current to remain ‘alive’, the LDO will continue to draw some current. For a good LDO, this quiescent current is typically on the order of microamperes. That might sound insignificant, but over a long duration this current draw can have a significant impact on battery life, particularly given that a wireless sensor spends most of its life asleep, up to 99% of the time, as mentioned above. The problem is multiplied when an installation employs dozens of sensors. The battery life becomes critical to avoid frequent and costly replacement. It’s also important that an LDO used in a wireless sensor application offers good transient voltage and load response. A key factor in managing a wireless sensor’s power budget is ensuring that when the device needs to send or receive data, it does so as quickly as possible to minimize the duration of relatively high transmit/receive currents. When asleep, the wireless SoC consumes just tens of nanoamps, but when transmitting or receiving, the current rapidly rises by two orders of magnitude. An LDO’s transient response to this is defined as the output voltage variation for a rapid load current change (Figure 3). The major influence on the transient response is the gain-bandwidth of the LDO’s control feedback loop. If the load transient is faster than the compensation loop’s response, ringing can occur, leading to EMI. A key issue in a low load wireless sensor application is that this is a region in which traditional LDO regulators suffer from lower loop gain. Some newer LDOs employ a low current mode circuit to increase loop gain under very light or no load conditions, resulting in improved transient response down to zero output current. Other important factors are package dimensions, number of peripheral components required, and cost. Texas Instruments’ TPS7A10 LDO is a good option for wireless sensor applications. It comes in a compact 1.5 millimeter (mm) by 1.5 mm package, has an input voltage range of 0.75 to 3.3 volts, and an output range of 0.5 to 3.0 volts. It’s stable to within 1.5% over specified load, line, and temperature variations. The output range nicely matches the input voltage requirements of the Dialog Semiconductor or Nordic Semiconductor examples described above (1.5 volts to 3.6 volts). Under typical wireless sensor operating conditions, VDROPOUT for the TI chip is just tens of millivolts (70 mV (max) at 300 mA (VOUT > 1.0 V)) and the LDO’s voltage overhead is around 250 mV. The LDO can source 300 mA and the quiescent current is a few microamperes. TI also suggests using the LDO to power the lower core voltages of the processors used in analog sensors. The LDO’s PSRR is 60 dB (at 1 kHz). TI enhanced the transient response by incorporating the low current mode circuitry that increases loop gain under very light loads. For experimentation purposes and to help get designs started, TI also provides the TPS7A10EVM-004 evaluation module. It has a single LDO and makes it easy for engineers to evaluate the operation and performance of the TPS7A10 under a range of operating conditions (Figure 4). Maxim Integrated also offers a good choice of LDO for wireless sensor applications, the MAX8636ETA+. The device comes in a 2 mm by 2 mm package and operates from an input voltage of 2.7 to 5.5 volts. The LDO offers two outputs; one is configurable from 2.6 to 3 volts, and the other is configurable from 1.5 to 2.8 volts. Both outputs can deliver up to 300 mA. VDROPOUT is in the tens of millivolts (90 mV (max) at 100 mA) with a typical wireless SoC load. The typical quiescent current is around 54 μA with both LDOs on. The MAX8636ETA+’s PSRR is 60 dB (at 1 kHz) and it has solid transient load response. If a negative voltage rail is required, a good option is Analog Devices’ LT3094 ultra low noise, ultra-high PSRR LDO. Aside from a negative voltage input of -1.8 to -20 volts, it’s other characteristics are similar to the TI and Maxim Integrated devices. It measures 3 mm by 3 mm and the output is up to -19.5 volts. The output current can reach 500 mA (max). The LT3094’s VDROPOUT is 200 mV for current under 100 mA, its quiescent current is 3 µA, its PSRR is 60 dB at 1 kHz, and its transient response is also solid. The device can be operated in parallel with another LT3094 LDO to reduce noise. Analog Devices supplies a demonstration board for the LT3094, the DC2624A, which forms a useful guide to the best circuit layout and bill of materials (BOM) to minimize noise and maximize the PSRR of the LDO. The TI, Maxim, and Analog Devices LDOs are all good options for voltage regulation of a wireless sensor employing a SoC such as the Dialog or Nordic Semiconductor devices described above. For example, consider a simple application where the SoC is the primary consumer of battery power, and the chosen battery is the Panasonic CR2032. The wireless SoC operates from a voltage input of 1.5 to 3.6 volts. The battery initially supplies a nominal 3 volts. If the chosen LDO’s output is selected as 2.5 volts, the input voltage specification for the wireless SoC is satisfied. The LDO’s efficiency when the battery is fully charged (i.e. supplying 3 volts) is 83%; after 1000 hours of operation at 20˚C and an average wireless sensor operating current of 190 µA, the battery still supplies around 2.7 volts and the efficiency has improved to nearly 93 percent. Assuming a roughly linear reduction in voltage output over the 1000 hour operation, the average efficiency of the LDO (under a constant 190 µA load) is 88%. Prior to drop out, around 74% (88% average efficiency x 84% accessible capacity) of the battery energy has been used to usefully power the sensor (Figure 5). Wirelessly enabled IoT sensors will continue to be employed in large numbers, making it important that design engineers consider how best to minimize power consumption, both while operating and in sleep mode. While a switching regulator is generally more efficient, under the power profile and usage mode of a wireless sensing device its efficiency advantage relative to an LDO quickly decreases. In addition, a new generation of LDOs is narrowing the efficiency gap, while also bringing improved PSRR, and faster transient load response. Combined with an LDO’s design simplicity, cost-effectiveness, compact size and low noise, its use as a standalone power supply for wireless IoT sensors is worth serious consideration. However, the key to maximizing the LDO’s advantages is to select one that more closely matches the voltage and current requirements of the wireless sensor’s electronics. LT3094 500 mA Ultra-Low Noise Negative Regulators Power by Linear™/ADI's LT3094 negative regulators feature ADI's ultra-low noise and ultra-high PSRR architecture for powering noise-sensitive applications. Nordic BLE Mesh Nordic's software development kit for Bluetooth mesh solutions using nRF51 series and nRF52 series enables new applications for Bluetooth in smart home, lighting, beaconing, and asset tracking applications. nRF52832 Bluetooth® v4.2 and BT 5 Nordic’s nRF52832 SoC is the first in a line of powerful, highly flexible, ultra-low-power, multiprotocol SoC devices ideally suited for Bluetooth® low energy.